According to this article, handmade crafts are making a big comeback in America, with $29 billion reportedly spent on craft materials in 2011. There are many reasons for the popularity of crafts again; some are working towards self-reliance, some want to learn traditional skills, some want non-commercial and unique items, some want the beauty of something hand made, others just love working with their hands. Whatever the reason, I think the trend towards homemade is just as strong in Australia and from what I can see, in the UK and many European countries as well. One of the things I'm working on at the moment is replacing some of my household linens. In the past I used to buy tea towels, tablecloths, dishcloths, aprons, curtains, food covers and the other bits and pieces we use here, but now I make all of it. I find when I make it myself, I get exactly what I want and the quality is superior to what I can buy ready-made. And let's face it, it's difficult finding a lot of these unusual linens we use in a simple home. How many times have you seen food covers on the weekly specials table? If we need cloths to drain yoghurt and cheese, a new rag bag, padded coat hangers or a linen apron that is longer than the average apron, those things we have to make ourselves. A milk jug cover doubling as a cover for our sprouter. 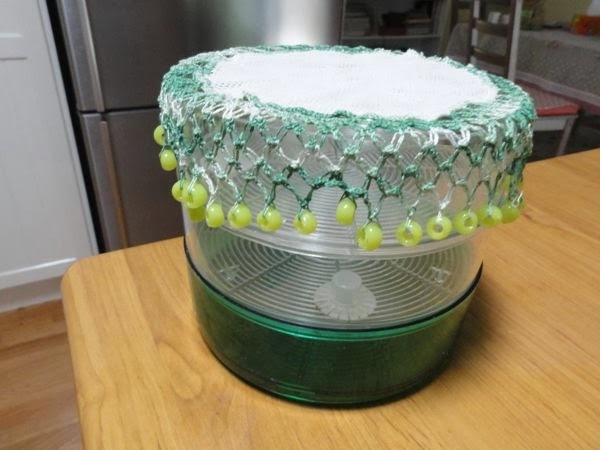 This is simply a circle of netting that has been edged with crochet and beads. Years ago when I started reading blogs, I noticed that many women used their spare hours for sewing, mending and knitting. Some ladies said they felt guilty doing craft work because they enjoyed it. The implication being that they were doing this work for their own pleasure. I don't look at it that way. I see all sorts of craftwork and traditional work as part of my housework. Looking after household linens is part of what I do. I am responsible for having what we need in our home and for keeping all of it in good order. I want to live in a comfortable home and sometimes, to supply that comfort, I need to make new items or repair the old. Sewing, mending and knitting is part of my housework; I see it as one of the duties of the homemaker, male and female. Our new set of table napkins. I use this food cover a lot, especially during the warmer months, to keep flies off the table. Someone gave me this cover, I wish I could remember who, but it is handmade of soft tulle and edged in a fruit patterned cotton. Some of the work I've done in the past week is to replace old napkins that have outlived their lives and will now serve us from the rag bag. I have replaced a lot of the "disposable" products, such as the paper napkins and dish cloths, with homemade items. 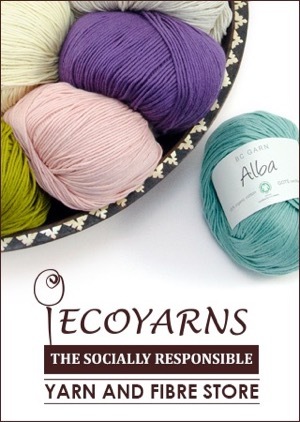 I make them here, choosing natural yarns and fabrics and wash and reuse them over and over again. It's a simple thing but it saves money and it makes you think about all the waste generated by purchasing what is supposed to be disposable. One of Jamie's toy bags. He uses these bags to store toys he wants to take home and bring back again. If you've never done anything like this before, I encourage you to make a couple of things, even if you're not a great sewer. Most of it is straight lines and simple sewing. You will get a lot of support and encouragement if you go to the forum and tell the ladies what you're doing, or if you need help. This is the link to our handmade forum that I recommend to both women and men who want to learn how to make and mend. No one will laugh or tease you, it will be praise and support all the way. You can try tote bags for shopping, fabric bags for kids toys and books, a linen bag in which to store your bread, food covers, dish cloths, napkins, tablecloths, jug covers, covers for your ferments while they sit on the kitchen bench, tea cosies, pot holders, curtains, cushion covers, a rag bag, a carry-all for your knitting or crochet, table runners, place mats or aprons. If you have a stockpile of fabric you have the ideal starting point for many of these useful linens. Some of them would make wonderful Christmas gifts too. Imagine giving your neighbour a loaf of your homemade bread in a linen bag that he could store it in. That would make a good teacher's gift as well. 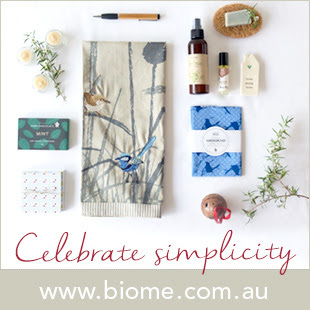 What about three organic cotton face cloths with some of your homemade soap. Beautiful! If you're hoping to improve your sewing, knitting or crochet skills, start by making one of these small projects. Remember, there is no such thing as perfect, so embrace the results of your beginner skills, if that is what they are, and know that the more you do of this type of activity, the better you get at it. What are you making for your home? Cuurently i am making a bunting to go around the deck when we move. I have a quilt on the go, dishcloths, a dress and 2 cross stitch. I also have begun a sleeveless knitted jacket with a shawl collar but put that aside while i am losing weight as i do not want to make the whole thing and then find it is too big when i get where I want to be. I like to have a variety of things as they all take different amounts of time to make and i can fit that in accordingly with my day. Lovely post Rhonda ! I collect used top sheets and pillow cases from thrift stores. They have very little wear and are a thrifty choice for high quality fabric. I stitch them into curtains, aprons, potholders and shopping/book bags and much, much more. Not to mention that one king size cotton flannel sheet keeps my husband supplied with shop rags for an entire year! Thanks for the great read and wonderful photos. I'm in the process of building up my dish cloth collection. I've also got lined curtains for my son's room ready to go. When I started sewing I was a complete novice. My lovely neighbour showed me how to use curtain tape and attach the rings when I made my first curtains. I was slightly embarrassed about not knowing, but she was so happy to share her many years of experience and even gave me some spare supplies she no longer needed. 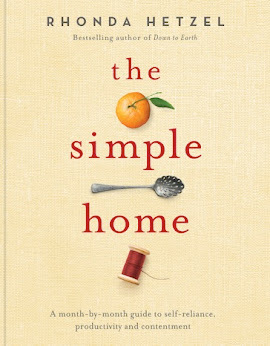 I love your homemaking posts! They always make me look forward to getting stuck into the day. We have swimming lessons later. I might take my knitting to do while the kids have their lesson! Morning Rhonda....I like your cheery napkins, and the large food net is a good idea. I have a handful of old net and beaded jug covers I found at Vinnies not long ago, they were just putting them out, so I was lucky. As well as making things I need, I also like to use vintage linens in good condition from the op shops, they're certainly one of a kind. And nice fabrics, if a little worn, can always be cut down into something else. Currently I've made a set of very simple roman blinds for my French doors, I just used some red stripe ticking fabric I found at the op shop, and they work very well to keep the afternoon sun out of my kitchen. I'm also working on a patchwork slip cover for a 2nd hand wing back armchair I bought. A challenge for sure, but slow and steady, I'll get there. I have been thinking about making some linen napkins for use at Christmas, I had better get moving on that project! I love this post as it fits in exactly with what I try to do in my home. I still have many bought tea towels and napkins but will make more of our own as required. I make potholders, handtowels, facewashers and pillowcases. I have even made sheets and doona covers. When my girls were young I was particularly frustrated by the lack of choice of doona covers for their rooms that did not include syndicated characters such as Barbie, Disney etc. I have also made Christmas gift bags in various sizes so that we can eliminate wrapping paper and the inevitable waste that it creates. 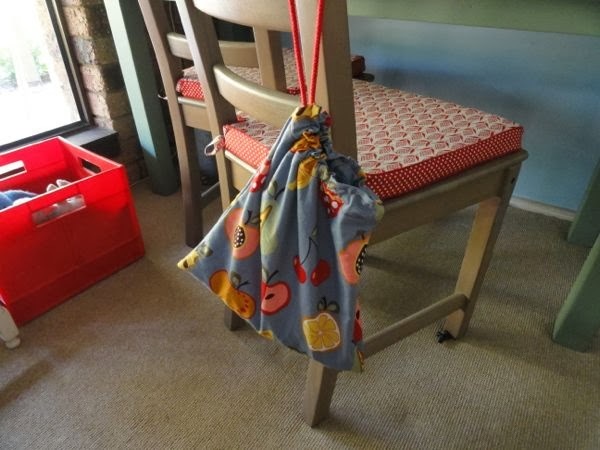 We have fabric drawstring bags that we use to carry our lunches to work. I did not make these as they were the bags that some organic cotton sheets that I bought were packaged in. They are strong, organic cotton and could easily be made at home. By the way, I recognise the handiwork of the food cover. :) I am so glad you like it and are able to put it to good use. Ah ha! It was you, Fairy! I remember now - we were in my kitchen. Thank you again. It's used a lot. I'm making christmas bags this year. Making gifts is so enjoyable and more so if it is a secret, one of the best fun Christmas surprises was when my daughter was about 3, I bought a second hand doll crib, repainted it and made a matress and pillow, sheets, pillow case, blankets and quilt, all in secret. Some matching, simple dresses for dolly and daughter were also a big hit. 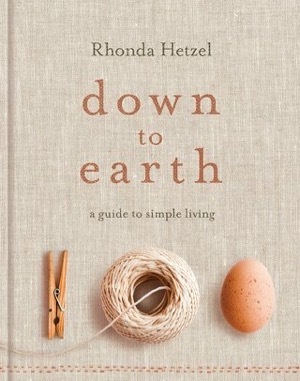 If you start simple and easy with sewing and knitting etc. you will improve sooner or later. When you are sewing anything, it is best to wash and iron the fabric if it is new and make sure the weave is square, some cloth is VERY skewed or stretched as it is wound on the bolt and needs to be ironed so you can see if the thread on the cut edge is straight, or needs to be straightened...have fun ! Just recently we "retired" a flannelette fitted bottom sheet as it was so worn in the middle that it was starting to tear. But when I looked closely at it, the fabric around the edges of the sheet were in wonderful condition! 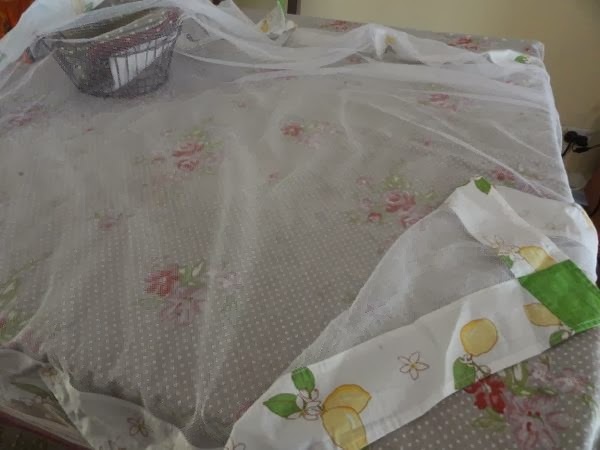 I remember my mum getting more wear out of a sheet by cutting down the middle then rejoining with the sides in the middle - an almost new sheet. So I made new pillowcases out of the bits of the sheet that were still good. Recycling at its best! I love craft! I usually have a number of things on the go - soft toys, clothes (crochet, knitted, sewn), dishcloths, cross-stitch, cards. The possibilities are endless. I've made fabric coasters (mug rugs) in fabric that I love, dish drying mats in bright colours for draining those awkward things that you can't dry properly by hand. 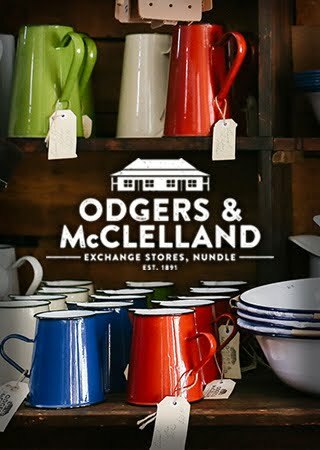 On moving to a new town, I found a craft group (I never could find one in Sydney) that has a shop for selling hand-made items. It has introduced me to a whole new world of people who don't think it is "cute" to make things by hand instead of buying them at the $2 shop. Looking at Jamie's toy bag took me back fifty three years. Auntie made me three little drawstring bags when I went to kindergarten, one for playlunch, one for lunch and a bigger one that I can't remember what it was for. The fronts had an R and a square embroidered on them. I adored those bags. 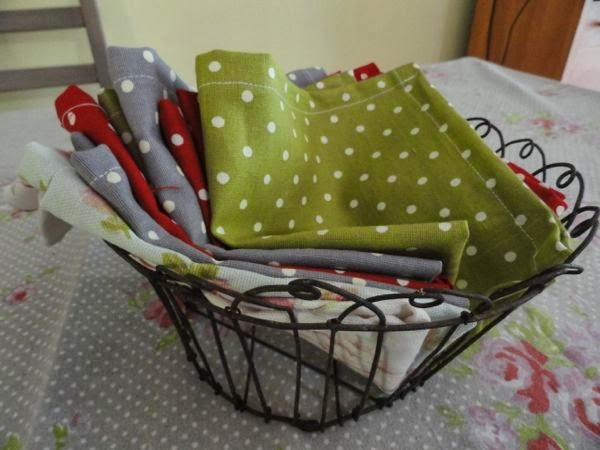 Hi Rhonda, What type of fabric do you use to make your napkins and tea towels? I would love to make some for my daughter for Christmas this year. Jan, I always use either cotton or linen but napkins and tea towels need to be absorbent so if I have no suitable fabric here, I always look through the cottons at the shop to find something soft and absorbent. Feel the fabrics, Jan, you'll know when you've got the right one for your purpose. LOVE sewing things for my home! I just finished hemming a tablecloth last night. I have gingham set aside for new napkins and I want to sew my husband a lunch bag. I've made a number of jar cozies - little padded covers for canning jars so we can use them in our lunch bags or picnic baskets without clinking and breakage. Tell me more about the large tulle cover for your table. I've never seen anything like that here in the States. You cover food with it? Or only the tablecloth? Why? love the blog, it is so nice to read about things I think are important. 20 years ago I made sets of napkins using my serger and calico cotton. We are still using the last of those napkins now, they have held up over hundreds of washings. We use colored napkin rings to "mark" whose napkin is whose, that way we get several uses before needing to wash if the meal wasn't too messy. 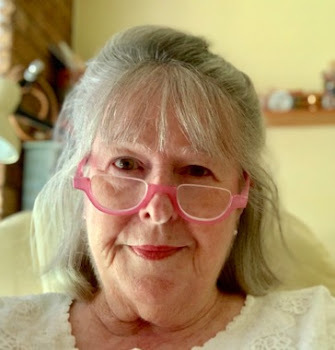 I also am a weaver, and save odds and ends of cotton yarn to knit dishclothes, they are very colorful, and better yet, free as the yarn was loom leftovers that would otherwise be thrown away. I didn't take my mom up on sewing lessons when I still lived at home, but that hasn't stopped me from trying to figure it out on my own over the years. Now I cannot imagine life without sewing--even if all I did was mend the rips I inevitably make in my clothing. Its SUCH a useful skill at even the most basic level. I'm now on to sewing garments and the like and cannot imagine how much it has saved me over the years. Thank you for yet another great post Rhonda! I got inspired and got to work this morning making placemats! What a wonderful way to look after your family! What an enjoyable post to read Rhonda. I've always loved to sew and craft, but viewed it as a pleasure & way of making clothes and gifts just how I wanted for many years. It still is that, but I'm also taking inspiration from your book and doing some of the simpler things I'd overlooked - re-purposing flannel PJs as wiping up cloths, making cotton facewashers, now I will make us a few sets of napkins we can wash and reuse so we can stop buying paper ones. With 2 young children and a busy business of my own (sewing!) I'm taking our move towards simple at a slow pace, but I'm loving the inspiration and ideas I get here. Thanks. My goodness, I just finished two lovely pillow slips in a rose pattern; they turned out beautifully and vastly surpass anything I might find in the shops. It was fun to make them. Excellent. Any other projects in mind? Yes, indeed, Rhonda Jean. I am making some tea cosies, napkins,and place mats as well. It has all been great fun as I have not made anything like these in a very long time. I read this post this morning on my phone before work and am just getting on the computer after work and in between storms. We bought the same sprouter at ALDI recently and I didn't like the fact that it had no lid and have been putting a saucer on it at night but that is a good idea to use the milk jug cover as I have a few of those. Brilliant idea! I hope you are getting a bit of rain with these storms, Rhonda. We haven't had a lot of rain as yet but apparently there are more storms rolling in from the west. Here's hoping we get the rain but not any damage. I don't really have time to craft these days but always seem to be sewing and mending (and I can't afford a sewing machine so it's all done by hand). A friend gave me a pair of brand new jeans she didn't want. They are too wide and long for me but I've taken then in and up (by hand) and they fit brilliantly. I constantly seem to be darning towels, socks, jumpers, gloves etc. It saves a fortune. Once we are out of debt (only two more months to go hooray!) I hope to have the money and time to start sewing for pleasure. How I agree with you about home-made items. The boom in home-made things is noticable in Britain too - a new magazine seems to come out every month! I have always sewn/mended/embroidered/made quilts and I think the difference now is that people have discovered how rewarding it is to develop skills and make things, however simple. I have recently bought some unfinished embroidered tablecloths and traycloths from car boot sale, and am now sitting down with my needle in my spare time and getting them finished. It is so satisfying. After a break from machine-sewing quilts, I am now making my daughters one each for Christmas and then have planned one for our bed, suitably inspired by some of the stunning quilts on Pinterest. The best thing you EVER wrote (and you reiterated it again today) was saying that we shouldn't feel guilty if we sat down with our sewing because we ENJOYED it. I threw guilt straight out of the window!! I also liked the sprouter cover idea and the table cover. What a great thing! I've never seen one of those before and I am sure anyone who likes to dine on their deck or who camps a lot would love one of those for their dinner table. Rhonda, you just give me some encouragement with this post. I love to sew, quilt, knit (also cooking). I have no problem with my passion of cooking everbody enjoy it, but I always feel guilty when I sew !!!!!! For today I will see that with other eyes!!!!!!!! I'm a homemaker and sewing is my job also!!!!!! I too, had a light bulb go on when I seen the food cover. I instantly thought of the big party that is getting planned for next summer for somebody's big 5-0, to cover up our food table from the unwanted guests. Definitely going to be sewing that. I also like the little milk jug cover. I found on pinterest how to sew bowl covers, so that project is on my winter sewing list. I would like to customise them to suit my decor. I also plan on sewing some for my two girls for part of their Christmas gifts. I too have made my own cloth napkins out of scraps of material. I am currently crochet a shawl for myself. The mornings are a bit chilly now and I find I get to over heated in a sweater. So many ideas even from the ladies that have commented! Love it! Love it! A nice big tulle food cover is definitely on my to do list for summer. I might also make some as gifts. I have 2 like this that hang inside my laundry cupboard. The cupboard also has a rag bag which is a bag I made that hangs from a coat hanger. This space always reminds me of my maternal grandmother. 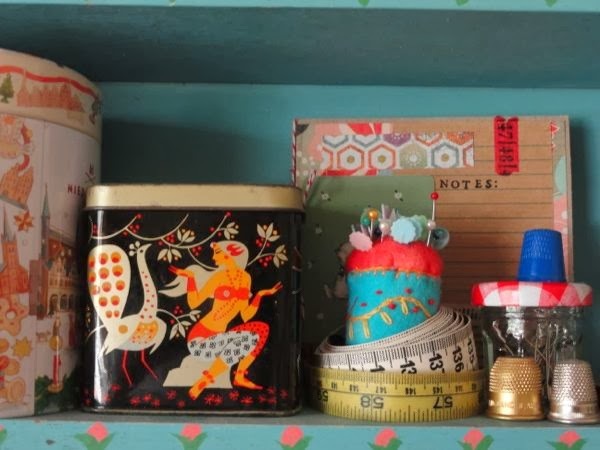 She had a similar cupboard in the corner of her kitchen and it was full of bags of recycled goodies - including washed, dried and saved foil milk bottle tops. We children were able to use them to thread on scraps of wool to make necklaces. Ah, the memories! People underestimate their skills in making these kinds of items for the home. Most of them are so easy to make, and the quality is far superior to anything you can buy in a shop. Better yet, they seem to last and last! I've recently started making all of the pillowcases in the house. It is a little more expensive than buying them, but they are so nice to sleep on and you can choose whatever fabrics you love. The same goes for quilts. In this hot climate a light patchwork quilt and a crisp cotton sheet is the perfect thing to sleep under in the warmer months. Much better than a feather doona. I think I'd like to start replacing the tea towels in the house with hand made linen ones soon. I do adore sewing and crocheting for my home and my family. My daughter very often asks me to sew something for her or as a present for her friends and it's a pleasure for me. Each Christmas I prepare lots of handmade presents, but just for people who understand the value of handmade! As far as the trend of homemade crafts, I can assure that it's the same in Italy. And the incredible number of magazines about handmade that has been increasing month by month can demonstrate it. Happy sewing, crocheting and knitting, Clara. Thanks again for yet another inspiring post. It's amazing how simple some mending can be if you have some basic skills. I have replaced several lots of elastic on fitted sheets recently, the sheets are in excellent condition but for some reason the elastic had perished. Much more satisfying than just going out and buying new ones, and then having to consign the old sheets to the rags. Although I have to admit a more consumerist friend was totally aghast at the idea, and couldn't understand my satisfaction. Each to their own I suppose, but I hope to help encourage people to think twice about replacing in future! Love the food cover. I'd probably put a 20 or 50cent coin in each corner to help weigh it down a little. Nice edge. I think the reason I buy and reuse thrifted linens is because I can buy what we had when I was a kid. There's nothing like the smell of clean washed and ironed thick cotton sheets on the bed at the end of the day. No, I no longer iron them, but still, sun-dried and crisp - then anywhere I am is home. Good linens, even linens with a patch on them, and I'm 6 years old again. I can't find anything new that is as good so I'm willing to hunt now and then and mend to keep fresh. And what can't be used as is, becomes smaller items or craft scraps. And I don't use plastic fabrics such as polyester or acrylic so nearly all our linens and clothes have to be thrifted or gifted. And preserved with mending.